For more than 25 years, Tom Zimmer, a premier builder, has been building exceptional custom homes throughout the Madison and Dane county area. Tom believes a good combination of quality materials, innovative design, added value, and cost effective techniques results in "responsible" building for his clients. You can often catch Tom Zimmer on the job site making sure things are going smoothly. It's the quality of craftsmanship, attention to detail, and commitment to customer satisfaction which assures a Zimmer Builders' homeowner of owning one of the finest homes in the Dane County Area. 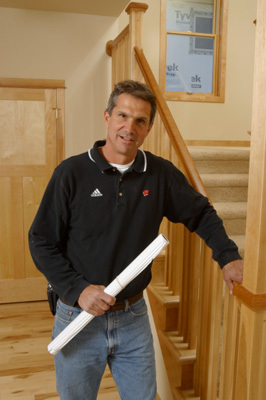 As a member of the National, State and Madison Area Builders Association, and extensive experience building Parade of Homes, Tom prides himself in knowing the latest building trends, materials, and techniques. Tom's skills, combined with the latest in equipment and technology, enable him to produce a precision end product with unique taste just for you. Tom knows the quality of subcontractors, tradesmen, and supplies which he consistently works with in a cost effective and efficient manner. He has had extensive involvement over the years with the Madison Area Builders Association as President, Treasurer, member of the Executive and Finance Committee, Parade of Homes Chair, Parade Site Chair, Chairman of the Greenbuilt Committee AND Builder of the Year! He is also a past member on the Board of Directors for the Habitat for Humanity. Your home is your place to spend quality time with your family and friends. Your home is your place to actualize yourself and achieve your dreams. If you want a home that will facilitate achieving your dreams, Tom Zimmer is the person to build it for you.